Tetras enjoy the company of other fish. Native to South America, the tetra family of fish has become a favorite in the aquarium hobby in good part because of the tetra's bright colors and schooling behavior. Successfully starting a tetra tank depends on your knack for recreating their native habitat and coaxing their natural behaviors. Start out with a tank that's 20 gallons or larger. While the tetras are smaller fish, they prefer to be in a larger group and in a heavily planted aquarium. A well-planted 20-gallon tank can hold about 48 neon tetras, although you won't want to start a tank with that many tetras in your school. Purchase a dark substrate -- aquarium gravel is the most common -- and place a thin layer along the floor of your aquarium. Being native to the Amazon and its tributaries, these small fish like a slightly darker environment. Install an external filter on your tank. The filter will help keep your aquarium water clean and pure. Fill your aquarium to approximately 1 or 2 inches below the top of the aquarium. You can use either a hose, a bucket or even your sink if the tank is small enough to fit. Install a heater for your tank. Tetras prefer their water to be between 68 and 80 degrees Fahrenheit. A heater will help you maintain this temperature and reduce the risk of drastic changes that can occur to a tank for a variety of reasons. Add live and plastic plants to your tank, making sure to leave an open swimming area for your school. The plants help mimic the tetras' natural Amazonian habitat, and the fish hiding in the vegetation. Floating plants help keep the tank a little darker and more like their native habitat. Run your filter in your new tank for a few days to make sure everything is running properly before moving forward. Test your aquarium water to make sure the pH of the water is between 5.0 and 7.0. Kits are available at aquarium- or pet-supply stores. 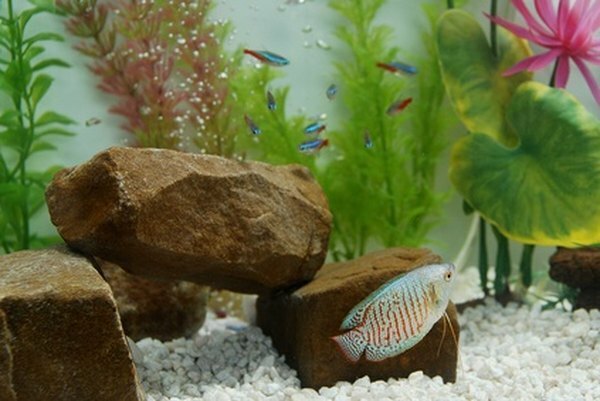 Gradually add your fish to the aquarium. If you just purchased your fish, place the bag with the fish in it at the top of your aquarium to allow your tetras to acclimate to temperature change. Follow the recommended amount of time by the individual or store who sold you your tetras. You can add dark aquarium backgrounds to the back and sides of your tank to make the inside of the aquarium darker and to add your personal touch to the tank.